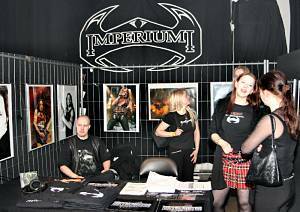 For years now it hasn't really come to my understanding why we finns haven't yet had our very own metal expo, a happening for metal consumers, musicians and businesses. The last time the matter crossed my mind was in Kuala Lumpur, Malaysia, last July while reading about PALA 2004 (pro audio, lighting and AV) from the newspaper, a tad different happening than FME though, but also with performing artists around the world. 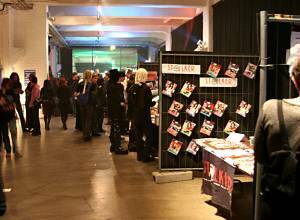 Maybe there just wasn't any person up to organizing such a thing here earlier, but the first Finnish Metal Expo finally took place this January in Kaapelitehdas in the heart of Helsinki and was a huge success with sold out Saturday. 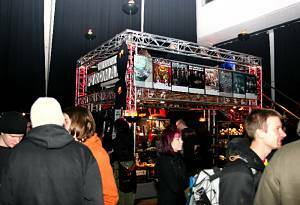 The metal expo offered live music, band contest and exhibition stands from magazines, music organizations, music stores, record labels and such. With the shown interest towards the expo from all sides, the plans for next years exhibition are under way, so keep that in mind when planning next year. The exhibitors' list included at least Roadrunner Records, Spinefarm Records, Kingfoo Entertainment, Hellsinki Rock Shop, Pyroman FX, Fullsteam Records, EMI Finland, Sony BMG Music Entertainment, Firebox Records, Dynamic Arts Records, Welldone Agency & Promotion, Hamara, Inferno, Noise.fi, Imperiumi.net, Sue, Stalker Magazine, Tuhma Magazine, Miasma, Encoremetal.com, Metalphotos.com, Ilosaarirock, Tuska Open Air Metal Festival, Sauna Open Air, Pellavarock, Nummirock, Astia Studio, Nuorisoasaiainkeskus / MD-Studio / Ääni ja Vimma, Elmu ry, Nosturi, Suomen Muusikkojen Liitto, Gramex, Verkkopaita.com, Musamaailma Oy, Pro Center (F-Musiikki), DLX Music, Levytukku Oy, Tähtiraketti, Warner Music Finland, Melscene Helsinki, Raskasmusiikkiteollisuus, Joy Factory, Sakara Records, WCH -Metal, Ruumisliina.com, Freedom Underground, Like Kirjakauppa, Poison Arrow, Fullhouse Records, Unity Bookings, Fastrock Factory, Legacy Tattoo, Chambers Magazine and Backline Rental Finland. A closed event called International Metal Meeting had invited at least Robert Kampf from Century Media, Andy Siry from Nuclear Blast, Sweden Rock festival manager Ingolf Persson and John Finberg, USA agent of Nightwish, among many other people to this meeting meant for music industry workers and the discussions wouldn't have probably interested the average music fan. Our very own photographer Kari Helenius, also from MetalPhotos.com, shared one of the exhibition stands together with finnish internet metal media Imperiumi and the interest towards his photographs was outstanding; from magazines and record labels, even artists such as Timo Kotipelto (Stratovarius), Alexi Laiho (Children Of Bodom), Lauri Porra (Kotipelto, Five Fifteen) visited the stand with curiosity. For some time now Kari has been photographing not just musicians live and in studio, but also famous athletes, animals and marine life around the world with success. So what you see in RockUnited is among the best photos in the internet. Here's what Kari thought about the event; "Mape Ollila from Imperiumi-magazine contacted me if I wanted to join Imperiumi at the first FME-expo to advertise Metalphotos.com. After considering it through (about 2 secs) I said yes and that was it. The exhibition stands were spacious enough to keep a small photo exhibit. I made ten posters from my photos and two portfolios, which included 40 pictures altogether. There was also an info package included, which I passed on mostly for the foreign visitors. Many of them visited the stand and my photos received attention more than expected. I even got a few photosession deals. I made a lot of new contacts and got many more visitors to my site, so in the end I reached my goal". RockUnited was also invited to the listening party of the new Thunderstone album. The room was filled with media persons and the band kept a humour-filled speach. While listening to the album two times, we were given drink coupons and Pasi Rantanen (vocals) was very open-handed with them. The drinking contest was ready to kick-off ! We actually sat in the room for over two hours not getting drunk enough, but Titus Hjelm (bass) was once again the life of the party, fooling around as usual and the rest of the band and guests, including members from Stratovarius, were also enjoying the servings. The new Thunderstone album, "Tools Of Destruction", includes ten songs, not having a track by the same name though but "Tool Of The Devil" as the first track and has material we've all come familiar with from the guys. They're still heavy, and haven't forgotten the necessary ballad either. Starbuck from Stoner Kings has been working with the band for this album and you'll also get to hear his voice in the midst somewhere. While gazing at the track titles, Starbuck wondered why "The Last Song" is not the last song on the album. Would've been suitable for sure, but the closing track instead is "Land Of The Innocence", a powerful track indeed and I couldn't help noticing how Pasi's voice has yet again gone through a slight change, still being powerful but now also having more roughness to it. The two listens didn't give much to write about though. The place was noisy, had bad acoustics and the overall restless mood took the interest elsewhere. The album will be out in April, so it's not a long wait anymore. 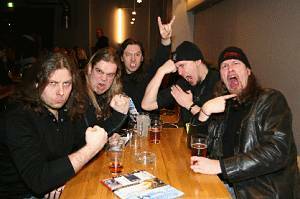 The Hilselinko-band contest had four final contestants and choosing the winner turned out to be a tough task for the judges, but SinKing won and will be performing at Tuska Open Air Metal Festival 2005 and recording sometime in the near future. Codeon and Kill The Romance were finalists also, but the third contestant Agonizer made an impact to the crowd with their catchy, raw and ballsy-sounding metal, having one of the best shows in this event. 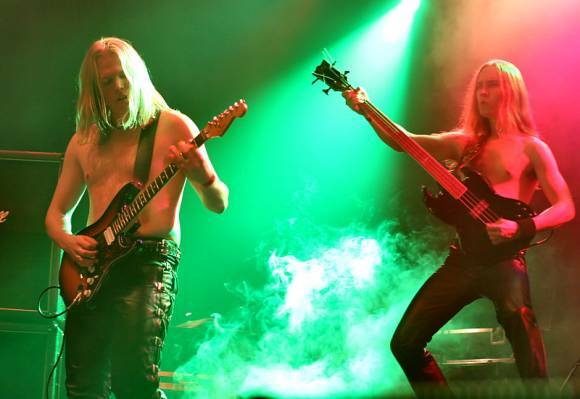 The other performing bands were Machine Men, Amoral, Total Devastation, Callisto, Pain Confessor, Godsplague, Mnemic (Denmark), Tarot (pictured above) , Sonata Arctica who played last on Saturday and were one of the bands that most people came to see that day, Teräsbetoni (pictured below) with their half naked show (evidently it was their fans that were running around the expo area half naked yelling things and scaring people, but they got a Teräsbetoni t-shirt if they dared to run around like that), Purity, The Scourger, Hevein, Finntroll (the most popular band in the event) and Velcra with their angry, shouting female singer. The old factory isn't the best place for live music, the echo makes the sounds distorted. The worst place to listen to bands here is in the other side of the hall, but most fans were packed in front most of the time, blocking the entrance to the exhibit stands at the same time which started from the other side of the stage. 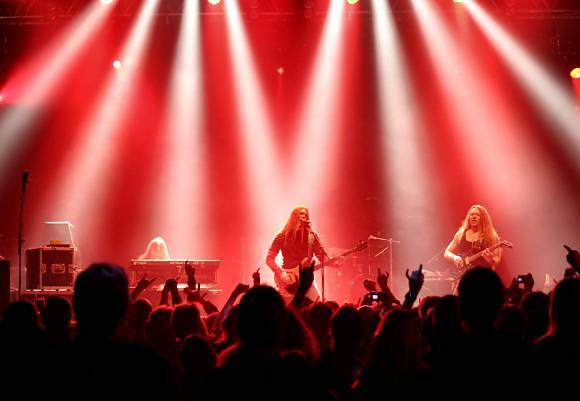 Clinics were neither forgotten, those included artists such as Kai Hahto (Wintersun), Kalle Torniainen, Lauri Porra (Kotipelto), Euge Valovirta (Godsplague) in humorous atmosphere, playing some Pantera for the demanding fans, Roope Latvala (Children Of Bodom), Tuomo Saikkonen and Kuisma Aalto from Mokoma and Petteri Hirvanen (Monsterball). The stage was really small and the space for the crowd too, so it was hard to see on stage unless you were in the first rows. For most of the part the clinics seemed too short, Hirvanen performed the shortest one and seemed a bit frustrated as he left so quickly, and the audience didn't seem to have too many musicians in it, the questions were few to the performing musicians. A metal fashion show Masquerade After Dark was presented by MagaLacrima & Anu Tolvanen, which divided opinions. Some welcomed the gothic clothes show while others felt the expo wasn't the right place for such nonsense. Personally I welcome anything that at least in some sense is combined to music, be it pop or death metal. And girls go for clothes and they tell other people what kind of a music fan you are. Most of the time anyways. There was also supposed to be an arm wrestling lead by womens world champion Tarja Tähtinen and Harri Naskali, but I never saw even a glimpse from that. Other fun stuff was watching the heavy metal karaoke and why not go there yourself. Even musicians like guys from Norther took the karaoke floor under the influence of alcohol, but pulled the show through well enough for the crowd to like. Queensrÿche's "Silent Lucidity" was heard at least during the event, and one had to wonder for the tough picks, it ain't all that easy to imitate the mighty Geoff Tate...you can picture the act in your minds and the alcohole talking. Or singing in this case. The first FME didn't raise much hairs, the only things that need improving for next year are the terrible smoke, smoking was allowed anywhere in the area and smelling it for the two days started giving headaches. Also aching feet weren't avoided, since there were only a few chairs and the food was really simple, nothing for vegetarians and only a hotdog for others. So some of the arrangements inside didn't work well, but the two day event passed with good points for most and it is one event to wait for next year. If the doormen are as polite next year as this year, you'll want to come again !